WARSAW – The road to playing college volleyball has not always been the smoothest one for Nikki Parrett. The WCHS senior though has persevered through the detours and roadblocks to achieve a dream. 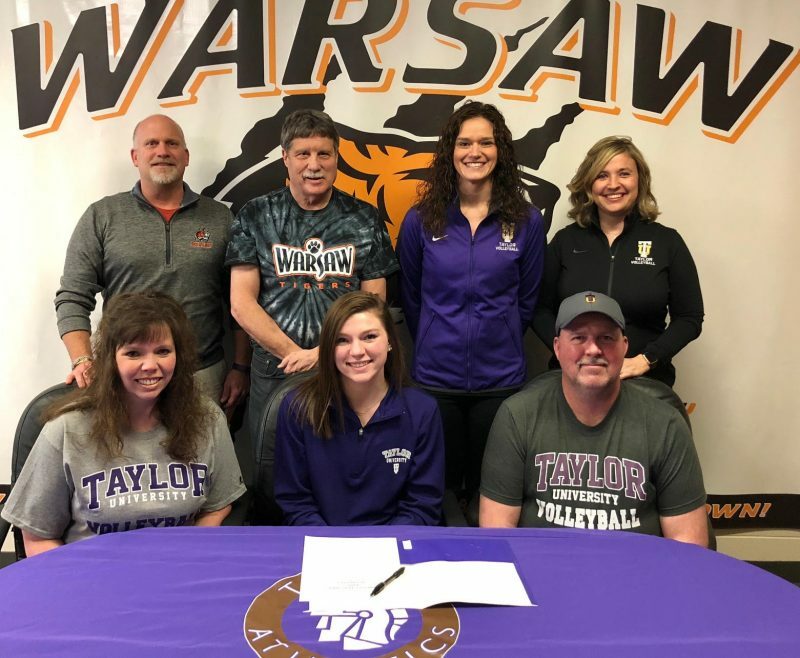 Parrett, who has dealt with more than her fair share of illness and injury during her prep career, signed Monday to play at Taylor University. Parrett, who missed most of her senior season last fall due to an ACL injury, is ecstatic to be headed to compete for the Trojans. Parrett missed time on the court late in her junior season in 2016 due to unexpected fainting spells. She had all kinds of medical tests done following the season and was found to have Vasovagal Syncope in December of 2016. Vasovagal Syncope, also known as Neurocardiogenic Syncope, involves the autonomic nervous system. This system controls automatic activities in the body and is responsible for maintaining things such as a constant internal temperature, regulating breathing patterns and a steady blood pressure and heart rate. Parrett, who had her first experience with the condition when she was 12, has done her best to try and enlighten people about Vasovagal Syncope. Parrett, whose condition is triggered by things such as temperature, blood and needles, wants people to know more about what has been called the “invisible” disease because you cannot tell someone has it by looking at them and they can be perfectly fine and within seconds can be experiencing symptoms or may faint. Parrett, who suffered her knee injury in April 2017 during volleyball club season, says she is feeling okay now. Parrett, who is currently finishing up her club season with her team in Fort Wayne, admitted that it was tough sitting on the sidelines for most of her senior season due to her knee injury. Parrett was able to find her fit at Taylor, an NAIA program and member of the Crossroads League. She will be close to home as Taylor, located in Upland, competes in the same conference with schools such as Grace College, Goshen College, Huntington University and Saint Francis of Fort Wayne. Taylor, which is coached by Erin Luthy, went 20-16 overall and 10-8 in Crossroads League play during the 2017 season. The Trojans had four seniors last fall on their roster. Parrett, who was an All-NLC selection after a strong junior season, is also looking forward to being reunited with former mentor and friend Chandra Hepler. Hepler, who was a three-sport star at WCHS, left the WCHS volleyball program late last summer to become an assistant coach at Taylor. Hepler, who played volleyball at Missouri, was 114-14 in five season as the Warsaw JV coach and also served as the varsity assistant to former coach Mike Howard and current Tiger coach Rick Ashmore. Parrett, who is the daughter of Fred and Kim Parrett, plans to major in Exercise Science at Taylor.